I was thinking of growing strawberries this year as my daughter and I love them. I have a garden 13x26 feet. Could you give me any tips? 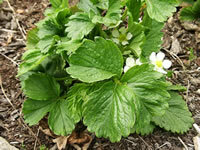 Strawberries, Fragaria x ananassa, are quite easy to grow. They are perennial, winter hardy, and will thrive in full sunshine, as long as the soil is fertile and well drained. Healthy plants will produce an abundance of berries for three to four years, after which they should be replaced. standard (June bearing) and everbearing Strawberries. You will want to consider how you will use the berries in deciding which varieties you want to grow. 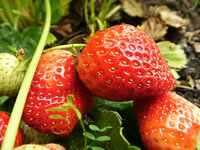 The standard types of Strawberry will provide you with a large crop all at once for jams or freezing, and tend to be the better quality berries. The everbearing will produce throughout the summer for desserts and snacking. The culture is essentially the same for either. Different varieties are listed at the bottom of this page. Planting time is determined by your plant hardiness zone. and set out in early spring, while temperatures are still cold. In mild winter areas, it is best to plant in the fall, giving you a crop the first spring. to establish itself and develop strength for a big crop. Strawberry plants can be grown in rows or mounds. The mounding method is best for everbearing types or in areas where drainage is a problem. with the first runners positioned with 6 inches of spacing between them. Only allow a few runners per plant, after which additional starts are cut off. In mounding, the plants are set at about 12-15 inches apart. Everbearing Strawberries should not be allowed to produce runners until the mother plant is exhausted, and you wish to create plants for future use. Strawberry plants need to be set carefully. The crown must be above the soil level, and the uppermost roots should be 1/4 inch below the soil level. A complete plant fertilizer should be applied alongside each row, or mixed into the soil if mounded. Water in the fertilizer well. A heavy mulch of sawdust, grass clippings, or even plastic sheeting should then be added to prevent weeds and to conserve moisture. Everbearers will need an inch of water each week during growing season. The plants should be fed again at mid season. When making your choice of varieties, be aware that some may be more susceptible to viruses than others, and therefore may be better for one area than another. Strawberries are subject to fruit rot (botrytis), root rot (red stele), and fungus (verticillium wilt). Consult your nurseryman about which varieties may not be appropriate for your area. Aphids and spider mites may be a problem, so the plants should be dusted or sprayed to control these. Slugs and snails may ravage your plants, so controlling them is also very important. Pesticides and fungicides should never be applied to the plants once the fruit has set. ALWAYS read the package carefully before using any chemicals in your garden or elsewhere!! !